The past few weeks has seen a lot of activity across our territory, be it Tournament support, Trade shows, Awards events, Dealer training and more. The West Australian Open was held at Royal Fremantle Golf Club recently. Jacobsen is a major supporting sponsor of the West Australian Open and we have committed to this support for the next 4 years. In that time it will go to Western Australian Golf Club, Royal Perth Golf Club and Cottesloe Golf Club. We had the AR722, Eclipse 322 and LF570 on display as well as lending them the LF570 for tournament support. We entered two teams in the Pro-Am on the Wednesday prior to the start of the championship and, along with local dealer McIntosh & Son, hosted lunch and refreshments in the clubhouse during the event for a selection of existing clients and prospects. This was a great way to build awareness and exposure for the Jacobsen brand. Congratulations to the winner of the championship, Daniel Fox. 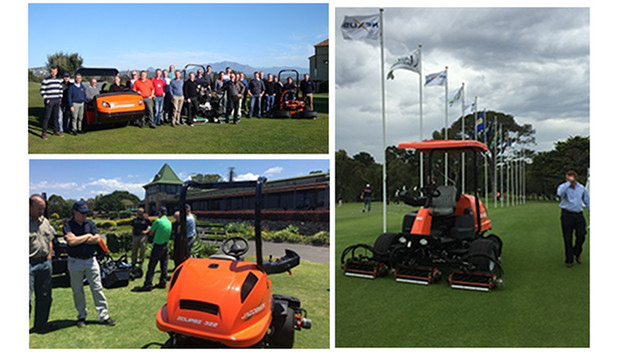 Staying in Australia, Sales Manager Mike Foskett completed the Round Table events with the final one taking place at Nudgee Golf Club in Queensland. Hosted by local distributor KC Turf Equipment, it attracted five delegates and again proved that these select events are an excellent way of getting current customers and future prospects together to help with the first stage of David Withers’ Three Bs initiative – Building Relationships. Service Dealer is one of our trade magazines here in the UK and we took the opportunity to attend their conference and awards with a group of UK Dealers. Ernest Doe and Sons were one of the three finalists in the Professional Turfcare Dealer of the Year category. The UK’s Institute of Groundsmanship (IOG) Conference and Awards were held in Birmingham and Ransomes Jacobsen sponsored two award categories. The IOG Ransomes Jacobsen Environmental Project of the Year was won by St George’s Park, the English Football Association’s national training centre. The Park’s 330 acres boast a wide variety of habitats, flora and fauna and a biodiversity action plan focuses on the conservation and regeneration of all aspects. Jim Dawson of the BT Murrayfield Stadium was the winner of IOG Alex R Millar DLF/Ransomes Jacobsen Groundsman’s Groundsman of the Year Award. The award, which acknowledges the role of an individual groundsman from within all the relevant professional grounds team award categories, recognised Jim’s expertise. In his previous role as head groundsman at Falkirk Football Club he twice won the accolade of Scottish Football Groundsman of the Year. 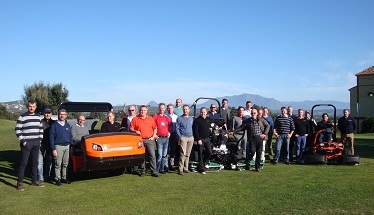 Over 40 delegates attended our European Distributor Training over a four-day period in Spain. The first group included distributors from the Czech Republic, Belgium, Holland, Italy, Portugal and Spain. The second tranche were from Norway, Finland, Sweden, Denmark, Germany, Austria, Switzerland. Indoor presentations were followed by practical use (ride and drive sessions) using both our own machinery and some from our competitors. A new addition to previous years was a session by Product Management with Lee Kristensen and Richard Tyrrell introducing the delegates to forthcoming products. It was also the ideal opportunity to use the assembled knowledge and experience of the delegates to gain information for future product development. The weather was superb and the commitment of those attending was very, very positive. 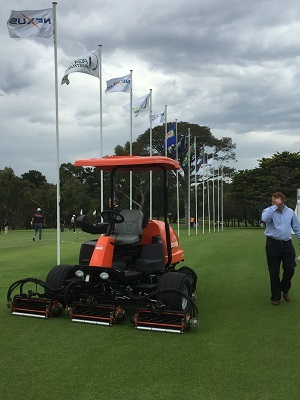 Smithco products in the Shandong and Henan districts of China, while Turf Equipment SA of Marston in South Australia will be distributing Jacobsen, Ransomes and Dixie Chopper products. the activity that is happening in our territory.